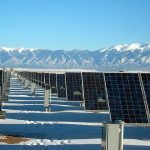 EnergyTrend, a division TrendForce, has recently published a new report Market of Advanced PV Technology. 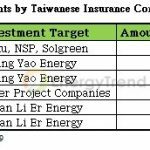 According to the report, requirements outlined in China’s Top Runner Program (3rd phase) will drive solar PV companies to improve efficiency in order to win the biddings on projects. This will further accelerate the development of next-generation solar cell technologies such as N-type. China’s National Energy Administration (NEA) has recently released the details of Top Runner Program (3rd phase) for 2017. Capacity of 5GW from Application Top Runner Program is expected to be connected to the grid by the end of 2018, while 1.5GW from Technology Top Runner Program will have to complete grid connection by the end of June 30, 2019. Technology Top Runner Program encourages the adoption of next-generation technologies which have not yet entered mass-production. In the scoring system of project bidding, advanced technology indicator – or the wattage output from next-generation products – accounts for the largest portion of the bid scoring, which presents a great opportunity for developers of next-generation solutions. EnergyTrend notes that the Top Runner Program just focuses on the module output requirements. But in order to win the bid, companies have to adopt more advanced specifications. In order to improve the cell efficiency by these technologies, such as PERC and Black Silicon, they can also raise module outputs using other designs or solutions, such as half-cut, multi-bus bar (MBB) or bifacial cells. P-type PERC cell technology has entered large-scale application. Newly constructed capacity of PERC cell in 2017 reached 42.38GW, an increase of 160.5% compared with 16.27GW in 2016, and the proportion of mono-Si PERC cell was more than 75% for 2017. In order to achieve higher efficiency and wattage output, companies will integrate P-type PERC cell with other aforementioned advanced technologies, or develop N-type bifacial cells. However, N-type bifacial cells, HJT, IBC, etc. are still in the early stage of development. In addition, the current prices of N-type mono-Si wafer are 20% to 30% higher than P-type mono-Si wafer, so N-type cell is more suitable for Technology Top Runner Program. In addition, P-type bifacial PERC module is also a focus of new technology development in the industry. Companies are able to improve efficiency with lower costs. The key for large scale application lies in the standardization of wattage output for the rear side of cell. The new standardization will depend on manufacturers and third-party certification institutions. 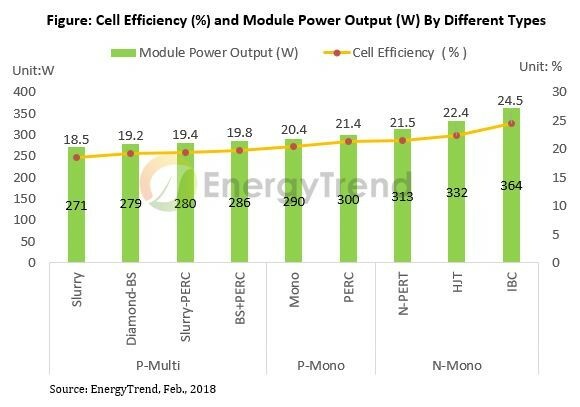 As for the development of advanced solar cell technology in 2018, mono-Si PERC cells remain better than multi-Si ones in terms of cost performance ratio. Bifacial cells, especially N-type ones, will gradually replace single-sided cells after the standardization of specifications is set. In addition, the next-generation solar cell technologies like N-type, driven by the special specifications of Technology Top Runner Program, are expected to become another wave of mainstream.